Melodies of Spain: Madrid and Barcelona with KING FM | KING FM 98.1 - Classic Radio Inc. This trip is currently full. To join our waitlist please contact Maria Drury at mariad@king.org. Beauty and fashion, flamenco and zarzuela, Picasso and Goya. 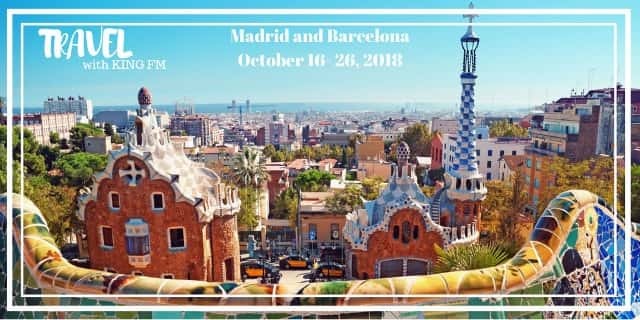 Revel in the glories of Spain with KING FM and host Marta Zekan on a tour to the stately capital Madrid and exciting Barcelona, this fall. Musical highlights abound climaxed by a concert performance of Rossini’s captivating opera La Cenerentola (Cinderella) starring the great Cecilia Bartoli in one of her signature roles. You will also hear a concert by the London Symphony Orchestra in Madrid; an opera performance at the world-famous Teatre del Liceu in Barcelona; a recital by the eminent pianist Arcadi Volodos, and an exciting evening of fiery flamenco! We will visit some of Spain’s incomparable museums: the Prado, Reina Sofia, and those dedicated to the great Spanish artists, Picasso and Mirò. Excursions take us to the ancient towns of Toledo and Segovia, Philip II’s imposing palace, El Escorial, as well as the home of the great cellist Pablo Casals for a private concert. Great music, great food and Marta’s commentary ― Olé! After on-air stints in Denver and San Diego, Marta came to KING FM in 1994. A California native and pianist, she has a music degree from UC San Diego, and an MFA in Voice Training/Speech Coaching. Along the way, she found a happy home in musical theatre, working as a vocal coach, music director, and keyboardist. She visited Barcelona and Granada a few years ago and is especially excited to experience Madrid for the first time, on this KING FM adventure. Her favorite out-of-country trips have been to Japan and Iceland, a memorable month spent driving around France, and she had the pleasure of living in London during her graduate studies. This group is limited to 25 participants. Questions? Contact Maria Drury at KING FM at 206-691-2993 or mariad@king.org or our tour operator, The Grand Tour, at 800-727-2995 or info@thegrandtour.com. The Spain tour is organized exclusively for KING FM by The Grand Tour Travel.